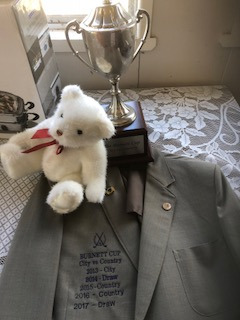 At Right: Burnett Cup perpetual trophy, the green jacket and mascot teddy hotly contested in the city vs country competition. Proceedings started Friday evening at the Royal Hotel (bottom pub) in Mundubbera with a strategy meeting over a pub dinner before an early night. Then on Saturday at noon it was off to the golf course for handicapping and the main event. 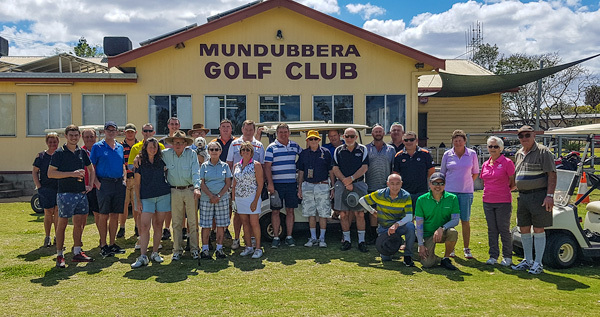 It could well be that Mundubbera Rotarian and Royal Hotel Licensee Gary Palmer overheard some conversations and passed them on to Country Golf Team Captain and chief handicapper, Mundubbera Rotarian Peter Hunsley, because things started to go wrong for City very soon after the start of the event. In the end, Country prevailed in the handicap ambrose matchplay event by 4.5 to 2.5. 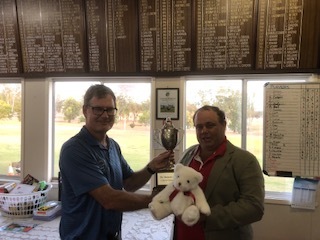 Special mention must go to Brisbane Rotarian Keith Watts who had such a good day that he and Garry Priddy not only notched up one of our two wins, but also prompted Peter Hunsley to declare Keith's handicap in violation of the first and second clauses of the Rotary 4-way test. Extra special mention to Ian Williams who only came to the golf club as coach and for the beer who was shanghaied much against his will into the city team but nevertheless brought a display of putting which netted him and Dan Williams the other rubber going City's way. Warren and Trish Walker of RCoB managed a square rubber, but the rest of us, including Michael Stephens, Paul Choy and Mark Williams disappointed the golf deities, allowing the Country team to retain the trophy. At Left: Country team captain Peter Hunsley donning the green jacket and accepting the trophy from City team captain Dan Williams. After the presentation, the City team retired to Mark Williams' place for a BBQ featuring the famous sausages produced by Sausage King and Mundubbera Rotarian Tim Duggan and his wife and Sausage Sage Robyn. A good time was had by all, and thanks to Fiona Williams, Dorothy Watts and Violet Choy for assembling the repast while the rest of us toiled around 18 holes. In the end, those who competed had some fun and we raised $1600 for mental health. Victory declared.